I picked up this book entirely on the recommendation of several readers that I respect their reading tastes. I'm so glad I did. This story is so...gah, anything I say won't do it justice. Just know that Corbin Wale is unlike any character I've ever read, but that gave him a magical, romantic quality that I adored. He made this book. He sees the world on a totally different level than most people and that's an incredible gift, especially for those around him who listen to him. And that's the gift that Alex receives...getting to see the world through Corbin's eyes. 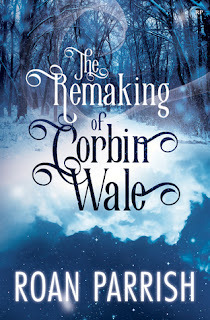 To most the world, Corbin Wale is odd, weird, maybe a little "off". He wasn't raised normally so he doesn't act as most people would expect. He says things that most people can't even interpret, but that's because he sees the world differently than most. I think he probably has a bit of psychic to him, but I think overall he's just incredibly intuitive. To complicate that, he spends the majority of his time alone and has been pretty traumatized by his life...everyone around him died when he was very young. That's a lot for a young mind to deal with. But if anyone takes the time to listen to Corbin, what he has to say is really astute. Alex is the first person to really listen and I think understand Corbin, although he's had people in his life who have been kind (although he's had just as many or more treat him cruelly, which is heartbreaking). Alex has come home after a hard breakup and ends up reinventing his mother's coffee shop into a bakery. The bakery turns out to fulfill his dream, but Corbin is the icing on the cake that he never expected. At first, Alex sees Corbin as someone a bit weird, but he's drawn to the strange man and begins to really talk to him. And then he uncovers the beauty that is Corbin. I loved this story so much. This book was a book that I read just for me over the holiday break and I'm so glad I did. I fell in love with Corbin and fell in love with Alex just for seeing the magic within Corbin, too. It's a beautiful story about love and life and I thoroughly LOVED reading it. Merry Christmas to me!